Before Galveston had a Sheriff J.B. Kline or Joe Max Taylor, there was a man named Frank Biaggne. He had been a Galveston police officer for eleven years before being elected sheriff and taking office on January 1, 1933. He was to serve in that position for the next twenty-four years at which time he was defeated for re-election by Paul Hopkins. He ran again in 1960, but time had passed him by and he retired from seeking political office. In reality, Sheriff Biaggne was exactly the kind of sheriff Galveston County residents wanted. Many Galveston residents have always maintained somewhat of the pirate mentality of Jean LaFitte, a one-time Galvestonian. There is a rich history of rogues, crooks, and local business owners cooperating to offer the illicit gambling, liquor, and prostitution services that other communities frown upon publicly while often sneaking over the causeway into Galveston in the dark of night to partake of these activities on the sly. As early in his tenure as April of 1938, after Governor James Allred ordered Texas Rangers into Galveston to close down illegal gambling operations, Sheriff Biaggne made clear his feelings about his job. He cooperated in closing the gambling houses and seizing gaming equipment. But he told the news media that he closed the businesses and seized the equipment reluctantly because he estimated that it could put as many as 500 workers and their families on county relief when they lost their jobs providing these services. One article published in The Texas Ranger Dispatch claims that Police Commissioner Walter Johnson bragged about being on the payroll of 46 whorehouses and that Sheriff Biaggne went around to the clubs and demanded money if the clubs wanted to stay open. While this may be accurate, it begs the question, if true, why didn’t the Texas Rangers have him prosecuted. The article, in my opinion, tends to glorify the honor and integrity of the Texas Rangers, possibly at the expense of other agencies. In any event, the Sheriff was apparently never charged with crimes and continued to be re-elected to office. One indication of what the locals thought of the sheriff, gambling, prostitution and illegal liquor can be found in statements made in 1951 by then Galveston Mayor Herbert Cartwright. When subpoenas were served on the Sheriff and other prominent residents of the County by the legislative committee that Biaggne later testified before, the Mayor called their investigation a witch burning. He also said that when he testified it would be embarrassing to “some state officials”. One might surmise that the Mayor knew of some of these state officials who secretly partook of Galveston’s easily obtained vice activity while publicly expressing their false moral outrage. The sociology of law enforcement work can be intriguing. Police agencies usually provide the kind of law enforcement that leaders of local communities want. When politics change, law enforcement must read the political mood of the community and make adjustments to the way laws are enforced. A great example of this is the civil rights era of the 1960’s. For years, agencies throughout the country did the bidding of primarily white business and community leaders by helping to keep black residents “in their place” by using a variety of policing tactics. Yet when the civil rights movement was successful in convincing the establishment leaders that they must change, there was no “memo” sent to law enforcement. Suddenly state and federal prosecutors were charging law enforcement officers with crimes of civil rights violations that only a few years previously were considered to be nothing more than “good police work.” As a result some officers lost their jobs or went to prison because they failed to read the “tea leaves” of public opinion quickly enough. 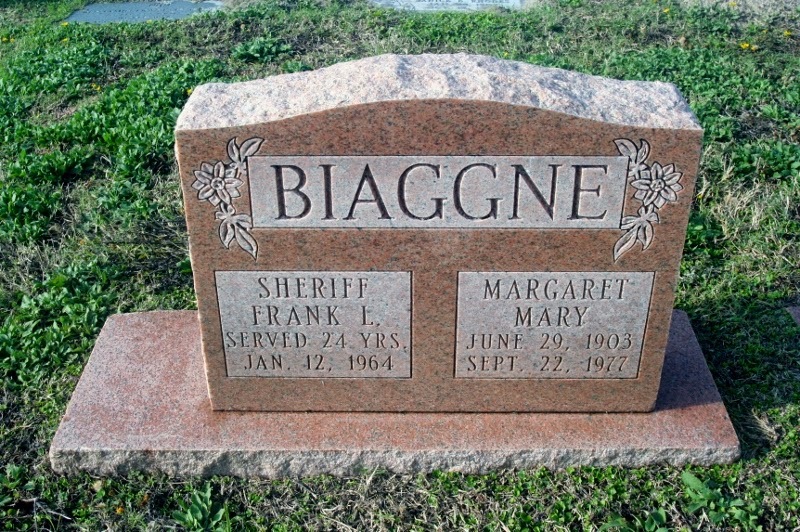 Sheriff Frank Biagnne was a man of his time for the citizens of Galveston County. With the exception of his final bid to retake the office of Galveston County Sheriff, he read the tea leaves well. The history of Galveston County is rich and those who identify with it often find humorous pride in that ribald era of pirate morality. The Sheriff died on January 12, 1964 and is buried in the Calvary Catholic Cemetery in Galveston. Herman Short – A Police Chief during times of change POLICE CHIEF WILLIE BAUER, REFORMER OR BAG-MAN?